This is the only still photograph in existence of a thylacine with prey. However, recent research suggests that the figure in the picture is a taxidermy specimen, arranged to look like a thylacine that has just raided a henhouse. 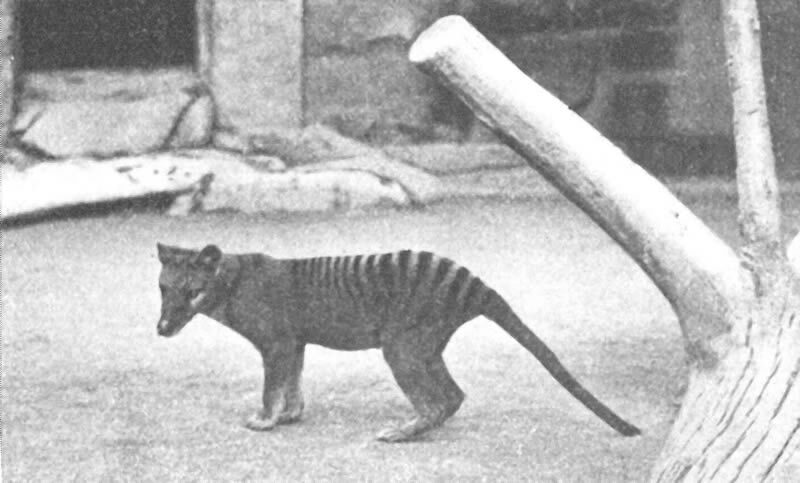 In his book The Last Tasmanian Tiger, Robert Paddle states that this image was one of the chief causes of “a blossoming of the construction that the thylacine was a significant poultry predator”. It appeared at a time that was crucial to the species’ survival – 12 years after the government bounty was lifted. The photograph was originally published in 1921 on the inside cover of volume 1 number 3 of the Australian Museum Magazine with the misleading credit "copyright photo from life – H. Burrell". The image was much more widely disseminated when re-used in the 1926 publication The Wild Animals of Australasia by A.S. Le Souëf (at that time curator of Taronga Park Zoo Sydney), Harry Burrell, amateur naturalist, and Ellis Troughton, zoologist at the Australian Museum. In the history of thylacine illustration, the photograph constitutes a refusal to allow photography to change earlier perceptions of the thylacine, exploits the veracity accorded to the medium, and illustrates the persistence with which scientific publications accepted and circulated negative and misleading representations. The [thylacine] is now getting rare in Tasmania. The inhabitants seem to have a superstitious dread of the ‘hyena’, as they sometimes call it, and will kill the wolf whenever opportunity offers. Indeed, some will even smash the wolf to pulp afterwards, thus depriving science of the skeleton and skin. In 2005 Carol Freeman analysed Harry Burrell’s photograph and found that the scene it showed was fabricated. The most significant problem is that this photograph fabricates the idea that the thylacine was a threat to poultry and, by extension, sustains the notion that it was a threat to sheep and human endeavour in general. In his book, The Last Tasmanian Tiger, Paddle interrogates claims of the thylacine’s predation on poultry, finds very few substantiated reports and points out that it has been referred to in publications so many times that it has been accepted in scientific literature and its significance magnified in a similar way to sheep predation. Paddle expresses no reservations about the power of representations and comments on the way the photograph has been cropped to disguise the caged environment and suggest that the thylacine is actually raiding a henhouse.The first appearance of the photo a little more than a decade after the end of the devastating government bounty on the thylacine, when few members the species survived, did nothing to support the idea that its protection and preservation was crucial. Carol Freeman. "Is This Picture Worth a Thousand Words? An Analysis of Harry Burrell's Photograph of a Thylacine with a Chicken." Australian Zoologist 33.1 (2005): 1-16. Many photographs of thylacines in the early twentieth century were taken in zoos in London, New York and Washington. There are no photographs extant of living thylacines in the wild. Washington Zoo. H.F. Osborn Nature: a weekly illustrated journal of Science LXIX, 1904. A number of bounties were placed on the thylacine in the course of the nineteenth and twentieth centuries. Two were imposed by the Van Diemen’s Land Company on their extensive pastoral holdings at Woolnorth, in the northwest of the island, in 1830 and 1839. 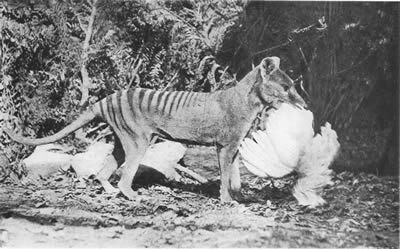 In The Last Tasmanian Tiger, Paddle maintains that the thylacine was used as a scapegoat to explain sheep losses in Tasmania from other causes, such as mismanagement, attacks from wild dogs and drought. A government bounty, resulting from lobbying by sheep farmers in the south of the state, was in force between 1888 and 1909. In the final years of this bounty the number of thylacines being caught slowed to a trickle. The year before the bounty was finally revoked, none at all were captured. Government statistics are a compelling indication of how effectively bounties, and possibly disease, exterminated the thylacine. Clive Lord, director of the Tasmanian Museum and Art Gallery from 1921 to 1933, consistently pleaded for the preservation of the species and other Tasmanian wildlife. Lord was awarded a Royal Society of Tasmania medal in 1930. But the loudest voices calling for conservation of Australia's animals, including the thylacine, came from America in the early twentieth century. In 1912 Henry Osborn, founder of the New York Zoological Society , listed the countries that had enacted laws to protect wildlife. Australia was not among them. In Our Vanishing Wildlife published the following year, fellow American, William Hornaday, noted that the "sheep-owners and herdsmen" were systematically exterminating the thylacine. Finally, James Barrett's book Save Australia: a plea for the right use of our Flora and Fauna published in 1925, urged the establishment of a breeding and experimental reservation at Healesville in Victoria. 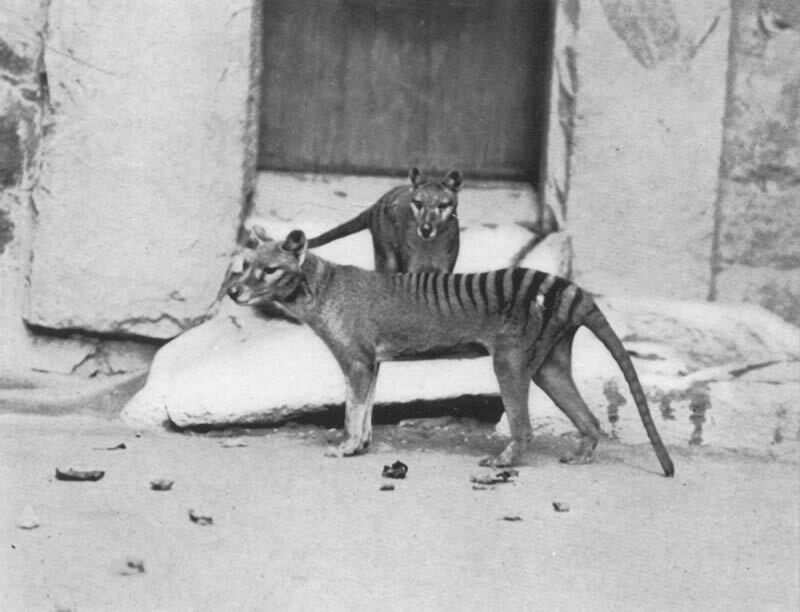 Despite early calls for preservation from the United States, Britain and the rest of Australia, thylacines were not protected until July 1936, less than two months before the last of the species in captivity died in Hobart Zoo. Photographs present a very different impression of the thylacine than that projected in engravings and lithographs, where background features were chosen for their visual appeal, to convey a mood, or project an inference. And in the same way that the medium of nineteenth century prints was integral to the messages they produced, so the processes, claims and limitations of photography were crucial to the role photographs would play in the representation of the thylacine and the narrative of the species’ extinction. Photography was perceived as different from previous picture-making traditions. Photographs were (and often still are) considered “accurate and faithful to the objects or scenes they represented” and “integumental likenesses – as passive recordings of pre-existing sights” (Snyder). Because they were perceived as evidence about an animal, supposedly above individual subjectivity, the artist’s eye or imagination, photographs of the thylacine in natural history works accumulate authority over and above that held by previous methods of illustration. However, the thylacine in a zoo was an erratic and disinterested photographic subject and it was almost impossible to avoid including the wire mesh and concrete of its often badly lit enclosure in a picture. 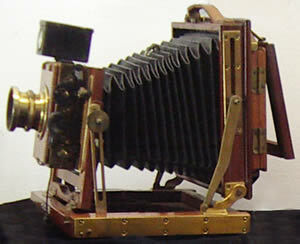 Some photographs show evidence of distortion as the camera failed to adjust the effect of the angle of vision, as an artist would. Technical limitations such as shutter speed in early cameras meant that any movement of the animal resulted in a blurred image. To compensate, some pictures were retouched, backgrounds were blanked out, animals posed, and tricks were imposed on the negative, the print, or the viewer. A healthy scepticism is therefore necessary when viewing photographic images of the thylacine.